Let Braun Production’s Aerial Talent Division custom create the WOW factor at your next Awards Dinner, Show, Event, or Showroom. Braun Productions Entertainment is focused on building loyalty and value for its corporate clients through a unique combination of great service, excellent products, unsurpassed performance arts, creative excellence, and technology innovation. An aerial performance in which one, two, three, four, or six artists are suspended from a large rotating sphere. Artists work opposite one another on the sphere’s horizontal ring or hang beneath it in a human chain. Includes all rehearsal time, costumes, props, rigging, and motor to fly aerialists. Costumes are custom made according to the clients theme and concepts. We can design them for you at an additional cost. Act Total: 2 person version – Price Quoted Upon Request. Timber Brown from America’s Got Talent! We created a one man version of our famous sphere act. It was recently performed by Timber Brown on America’s Got Talent. The theme is a cosmic space ship. 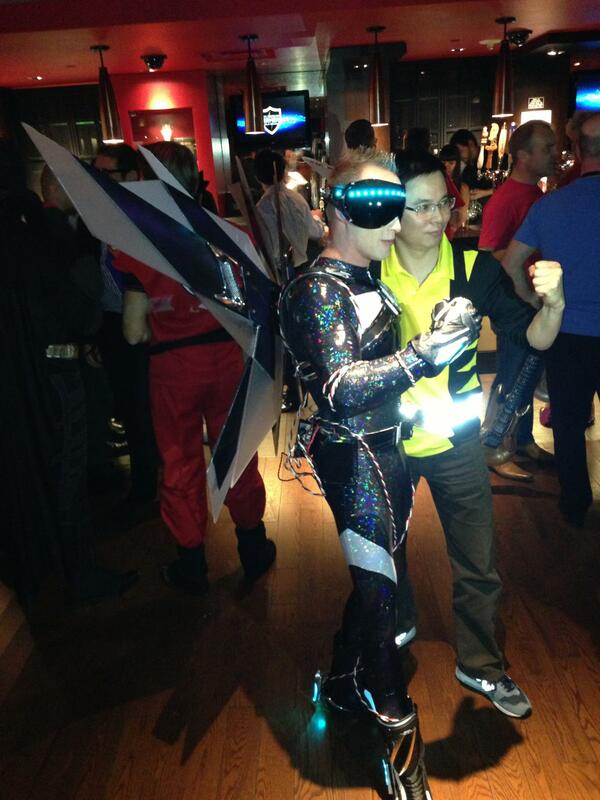 Timber also does a walk around for “Meet & Greets” dressed in a silver and black holographic body suit in addition to his 4 min cosmic sphere act. Includes all rehearsal time, costumes, (as seen in photo) props, rigging, and motor to fly aerialists. * Costumes are custom made according to the clients theme and concepts. We can custom design them for you at an additional cost. Four artists are suspended by the wrists on four chains. The act is high paced and visually spectacular. A real crowd pleasure! *Includes all rehearsal time, costumes, props, rigging, and motor to fly aerialists. Costumes are custom made according to clients theme and concepts. We can design them for you at an additional cost. Four to eight artists perform in a large spinning net. The number is a hypnotic showstopper as the silhouette of the performers and apparatus constantly changes in unexpected ways. Includes all rehearsal time, costumes, props, rigging, and motor to fly aerialists. Our Angels come in every theme shape and size. We can create a look big or small that fits your budget and event. These Wings were custom made for the MGM’s High Roller New Years Eve event. Our client requested a “Count-Down Angel” that would be used in the count down celebration at midnight. 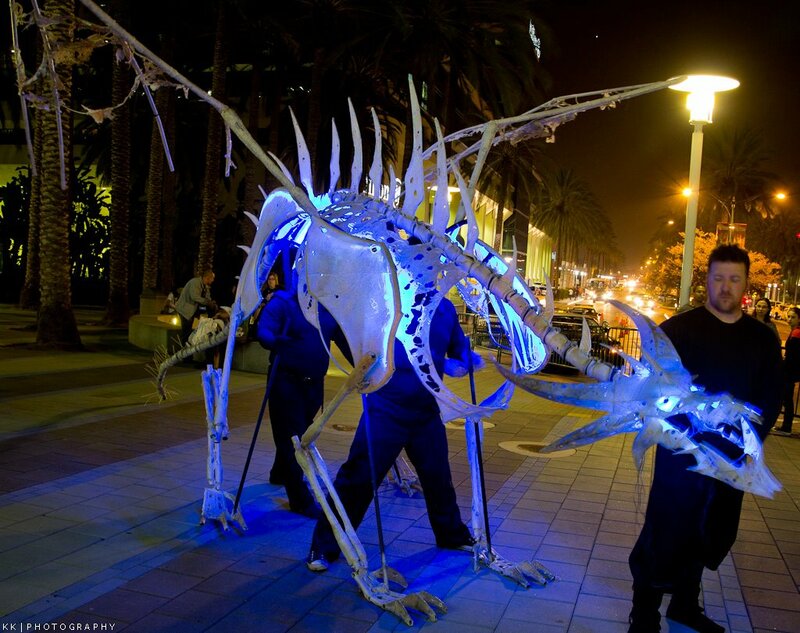 We have amazing Dragons that come to life at your event to the amazement of all. 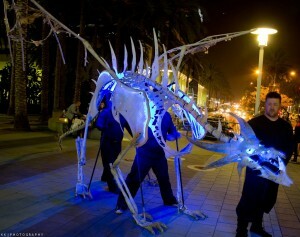 Our full size puppet dragon is a HUGE photo opportunity that draws massive crowds at every event. Our Dragon is friendly and can breathe smoke out of his nostrils. He is LED lit and creates a wonderful air of magic and wonder with all whom he interacts. He is a real crowd pleaser and a sure fire hit at every event. He can walk around “Meet & Greet” style or can be incorporated into any of our acts. An aerial act in which the artist is suspended by one, two, or four straps anchored at the wrists or feet. The straps attach at a single point in the rigging. This setup allows for either slow paced dramatic effects or high speed dynamic performances. Either moving through a single vertical plane or dashing across the stage to build speed and swinging in large sweeping arcs over the stage or audience. We have a wide range of artists available, including Alan of Zumanity, who perfectly fits the role of a Gnome. This can be performed as a solo or couples act, a standalone act, or in concert with another performance. Similar to straps, the silks though tend to be more elegant and less exhilarating. A modern and sophisticated twist on a well know routine; Pole Dancing. Performers demonstrate stunning skill, strength, and flexibility. This works well as the center piece of a larger performance. Using one performer or multiple performers gives us an interesting opportunity to develop a number to be conservative or edgy depending on the clients desired effect. A slow paced, truly impressive demonstration of strength and technique. The artist can perform on nearly any surface. There are many interesting props and apparatus’ that can be utilized depending on the theme desired. This can be used as a feature or as atmospheric performance. Similar to Hand balancing, but preformed with two or more artists using one another as the base from which they balance.